Cmdr. George Kessler, executive officer of the destroyer Spruance, and Cmdr. 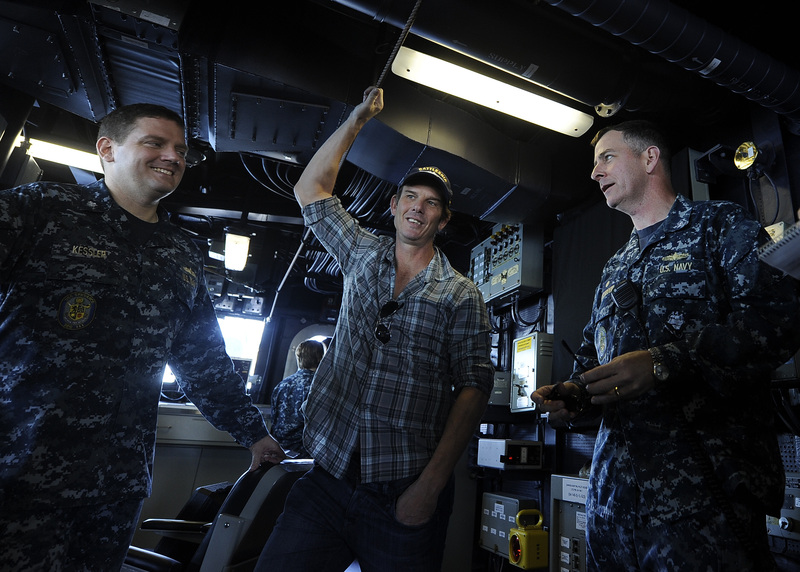 M. Tate Westbrook, the ship's commanding officer, give a tour to Peter Berg, director of "Battleship." It’s shaping up to be a traditional Super Bowl Sunday: A six-hour pregame show followed by football, snacks, drinks, aliens, surface warships and Liam Neeson. The last part might need an explainer. “Battleship,” the action movie somehow based on the board game of the same name, will debut in theaters this May, but you’ll get a new 60-second sneak peek during the first quarter of Sunday’s big game, Deadline New York reports. We’ve shown you earlier, longer trailers for this one before, but this’ll be the biggest audience yet for the SWOs-vs.-aliens adventure, which stars Neeson, “Friday Night Lights” youngster Taylor Kitsch, hip-hop artist Rihanna, Sports Illustrated eye candy Brooklyn Decker and, maybe, a sensible plot (not pictured in any previews so far). Deadline also reports director Peter Berg will use Kitsch in his upcoming movie treatment of “Lone Survivor,” a real-life tale of heroism by retired Special Warfare Operator 1st Class (SEAL) Marcus Luttrell. IMDB pegs that film for a 2013 release. Looks like a steaming pile of crap.